I have wanted to make a downdraught table for some time, and now I have finally got around to doing it. What is a downdraught table? 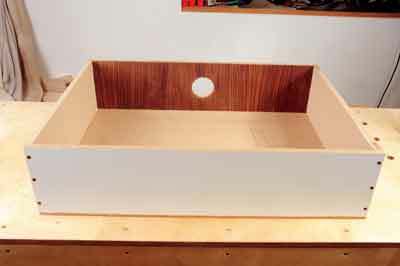 Basically, it is a shallow box with a perforated flat top surface of some kind, for sanding on. It is connected to an extractor, which draws the fine and dangerous dust down and safely away. 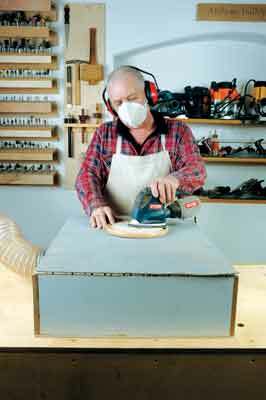 You cannot just junk the PPE, since sanding dust is the finest and most deadly. You should still wear a suitable mask, but it does at least fulfil the old adage 'deal with the problem at source'. I made a shallow rectangular box using scrap lengths of MDF. It is 700 x 520 x 160mm, but you can make it any reasonable size you like. 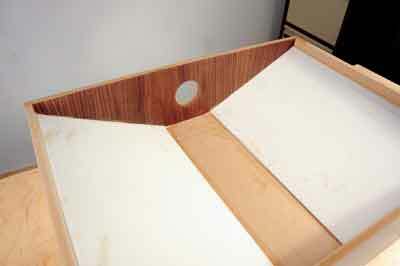 All the screw holes were pre-drilled and countersunk to prevent 'puffing' the MDF. The extraction hole more or less matches a 65mm hose reducer I had in stock. Two pieces of 6mm MDF were cut and bevelled along the long edges and glued into place - as shown here - so the dust will tend to fall to the middle and cannot build up in the corners of the box. The next step, making a bevelled piece to go at the back of the box, involved a little guesswork and hand plane adjustment until it fitted nicely. 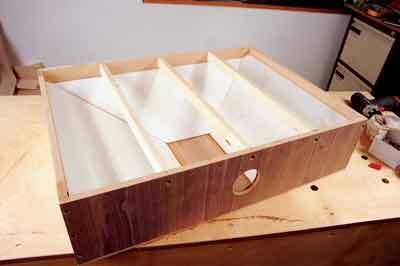 Again, the edges were bevelled and it was glued into place. The perforated top was going to be quite thin so plenty of support was needed, in this case some offcuts of 'doorstop' batten. 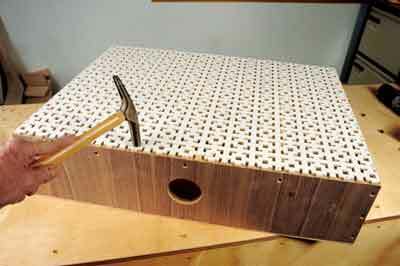 These are drilled, glued and screwed into place, evenly spaced across the box. I nearly used a piece of pegboard, but I decided it might not draw enough air through and be rather inefficient. Instead, I used an offcut of punched decorative hardboard. 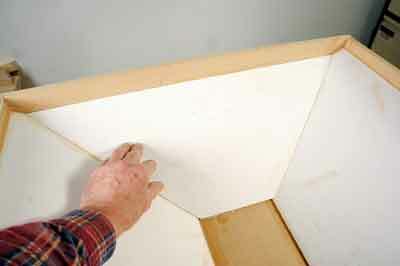 It is panel pinned in place across the frame and battens. The reason for the width of the box was that it matched a roll of perforated rubber, rather like 'routermat' which I found in the local DIY store. Hooked up to the GMC Workshop HVLP - High Volume, Low Pressure - extraction system you can feel the air drawing through the hardboard and rubber mat on top. It seems to work, resulting in a clearer, dust-free atmosphere. My next step is to connect to a dedicated drum extractor because I think it will draw even harder!